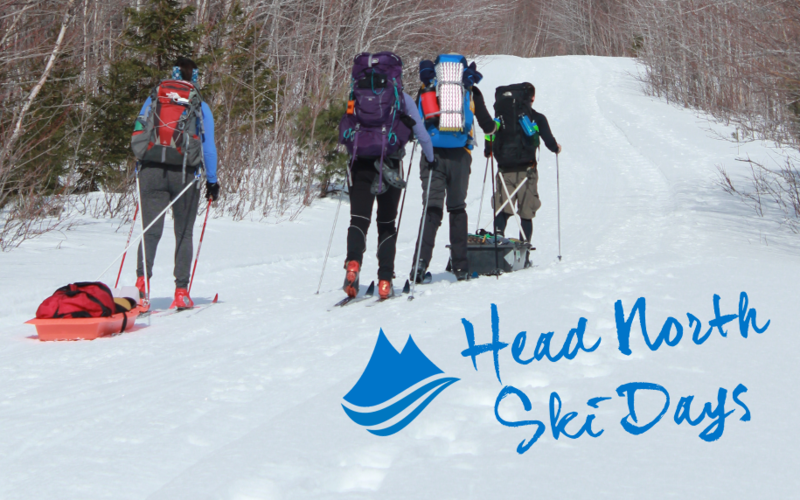 Head North Ski Days is Friends of Katahdin Woods and Waters and Elliotsville Plantation Inc.’s weeklong winter recreation event offering free XC ski equipment rentals for visitors to enjoy the beautiful terrain in the north end of Katahdin Woods and Waters National Monument. 2019 marks the sixth annual Head North Ski Days. From March 16th to March 22nd, join us at the North Gate (aka Matagamon Gate) where you’ll find an Outdoor Sport Institute trailer stocked full of rental XC ski skis, boots, and poles, presented to you free of charge by Friends of Katahdin Woods Waters. The trailer will be open and staffed each day from 10 AM to 2 PM. Over 16 miles (25 km) of trails throughout the north end of the Monument will be groomed courtesy of Elliotsville Plantation, Inc. (EPI). On XC skis or on snowshoes, you can explore along the shores of East Branch of the Penobscot River and head south to Haskell Pitch, the Big Spring Brook Hut, or Bowlin Camps.